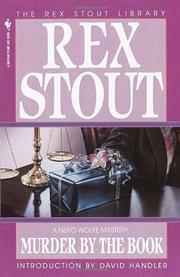 A full-length Nero Wolfe takes "Fatty" through the book publishing business, a legal firm's professional and personnel problems, and Archie's Way with the Dames. Three apparently unrelated killings are tied in with a pseudonymous author of an unpublished book and Wolfe's potency of knowledge, used as needed, brings the killer, after one more death dealing, to proper punishment. Sitzlust with a sizzle.